Despite the title of the post, I’m not sure what I’ll be covering in this post, aside from sharing some history of this region and what I’ve heard of the upcoming magic date (“8/8/8 ” in numerology), and the recent news story that was Cecil’s death, and the Strength card (8 in the Tarot’s Major Arcana). I’m sure it’s all a coincidence that all this has been happening while the Sun is in the constellation of Leo! The energy that’s been around of late has been… hectic of late. This card has appeared in half my card readings this year. I feel a personal connection to this card for a few reasons, the biggest being that I feel this card illustrates Leo and Virgo together–and I was born close to that cusp (a few hours into Virgo). 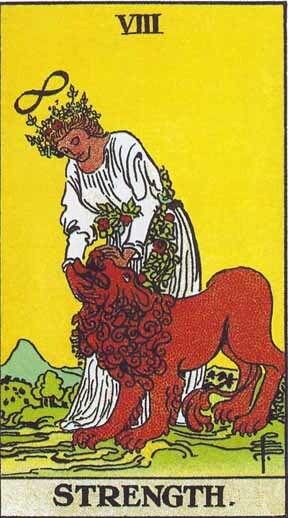 The Strength card shows a woman in white, calmly and gently holding the lion’s head/mouth as the lion sticks out his tongue amiably. The woman is covered in greenery (on her robe and in her hair), hinting at abundance. She is also the only figure in the Tarot, aside from the Magician, who has the lemniscate (the infinity symbol) over her head, hinting at spiritual mastery. The Strength Tarot card shows a balance of the aspects of you that are human, animal and divine. It may seem impossible but love, kindness and a brave heart can bring them into balance. In a Tarot reading, the appearance of the Strength Tarot card indicates a time when you need to be very conscious of your instinctual urges and reactions, and bring them into balance with the greater good and meaning in life. This is not a time to act out in rage or in hatred but instead to look at the situation from a place of love and compassion. Cecil was killed–sorry, murdered–on the 1st of July, but the news of his death and suspected murderer were broadcast near end-July. I had not known of Cecil before his death, and found the photos and news stories heartbreaking, as they were for many others. By all accounts, Cecil and his pride had been used to human beings, and entirely non-threatening. In the Strength card, the Virgin in white demonstrates true strength and mastery by showing no fear of the wild cat beside her. She co-exists with it. I’ve always read this image as one of Stewardship. (When I gotta check or clean my dog’s teeth, I think we look much the same. ;) ) It takes strength of character to allow the presence of a creature with whom we may not naturally co-exist–we need to recognise that they have the same right, or more, to be there. This world has space enough for all of us. Of course, in the language of Tarot, the “lion” refers to our base instincts–fear, negative emotions, out-of-control emotions, pride, and ego. But the lesson of Strength isn’t to destroy them, but to acknowledge them, accept them, face them, and remove their bite. The unchecked ego, pride and self-righteousness of Walter Palmer and other hunters like him put their self-gratification over respect for nature and life. It wasn’t a huge surprise to hear of Dr. Palmer’s other hunting trophies and a previous sexual harassment suit brought against him by an ex-employee. While I agree the dentist and other hunters should be charged and serve time (and certainly it’s been a chuckle reading some of the Yelp! reviews on his dentistry practice), those who have resorted to death threats are unfortunately demonstrating the ugliness that results again when we think we get to decide who gets to live or die. The Strength card, reversed, can point to weakness, whether in will or character. It speaks of a lack of courage, self-control, and the lack of mastery within. Whatever we cannot and will not face within, we tend to project without, and try to fight/destroy. Amazing card for right now. So here’s where I’ll allow myself to sound stupid, in that I think 8/8/2015 is a cool date. I can find information about the energies this Saturday, where, as far as I’m concerned, sounds like a fabulous time to join a meditation circle (and I’ve been asked to two). The stuff about portals and gateways is a bit above my pay grade (for now ;) ), but telluric energy, elementals and ascended masters, these I can work with. 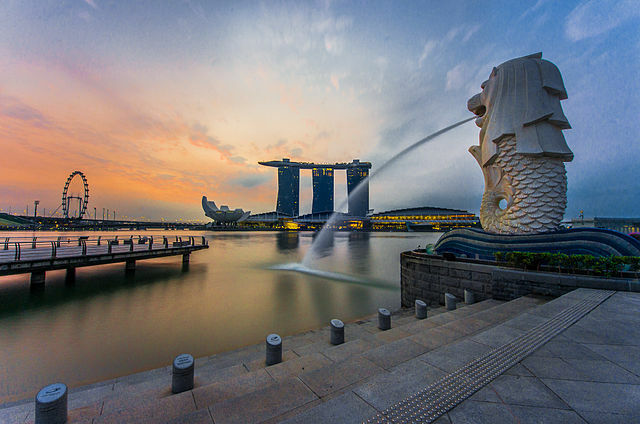 “Rear view of the Merlion statue at Merlion Park, Singapore, with Marina Bay Sands in the distance – 20140307” by fad3away. Licensed under CC BY 2.0 via Wikimedia Commons. And now we come into my neck of the woods. The Lion City is Singapore. Its name was derived from Sanskrit, Singa (lion) and Pura (city), back in the days Sanskrit and Hinduism had traveled south from India into Southeast Asia, and before Buddhism and Islam had yet caught up. His ship, caught in a ferocious sea storm, would have sunk if the prince had not thrown his crown into the sea to ask for peace. He had to give up his former status/kingdom in order to obtain a new one. He had to submit his pride and sovereignty to the nature spirits before they would spare and reward him. He had to submit to spiritual guidance (received through the crown chakra, or symbolically the crown) and have faith that it could be renewed even after the sacrifice of the symbol of that connection. Or the crown could have been an object of immense spiritual/psychic power that was instrumental in taming the natural forces guarding the island. The story of Singapore’s founding is told as a triumphant story, as I suppose all stories of conquest are. Interestingly, in 1405, Singapore’s importance as a kingdom waned when a new king, Parameswara, was forced to flee due to a local scandal (of his own doing). The tropical island languished until the British arrived in 1819 to turn it into a trading port, and subsequently, a thriving colony and WWII naval base. The island nation dates its independence from 9th August, 1965 (a day after the Lion’s Gate). We celebrate its 50th anniversary this Sunday. 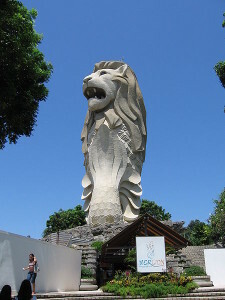 I’m not much for nationalistic hooha, until all the lion symbols and stories and dates gave me a massive headache on Sunday, after some portal work near (ahem) a huge freakin’ Merlion sculpture (see right). This is our local version of the Statue of Liberty; visitors to this one have to get to Sentosa island and can enter and go up to the lookout on/inside the Merlion. The Merlion is half fish, half lion. I wish the creature had been named or created in the Sejarah Melayu, but amazingly, it came from the Singapore Tourism Promotion Board in the late 20th century. They wanted a tourism symbol that would capture Singapore’s name and its maritime connections and history. We still have one of the busiest ports in the world, next to one of the busiest shipping channels in the world (The Malaccan Straits). I’m cynical of all creations from the local civil service, but the design and logic behind the Merlion remains kinda neat. Google Map graphic of the area between Singapore and Australia (bottom right). Singapore (the lion city) has a disproportionate amount of healers, teachers and light-language speakers compared to other cities / countries around the world.It may sounds strange, but for a while, I felt like the the only person in the meditation circles here who couldn’t speak light language. It still eludes me (though I grok it when spoken) but it did strike me how many people here can speak it. This noticing was further bolstered when someone told me that there were maybe “three light language speakers in all of Germany”. Anecdotal, perhaps, but interesting. As mentioned, the remarks on the high density of lightworkers here have come from independent sources. Singapore is near/on top of a vortex or hot spot, hence the portals and extreme energies in the area. Not all of the energies here are good; on the contrary, there’s what I call the karmic WWII muck, the political fear fog, the materialistic mire (I should turn this into a Harry Potter epic), and the religious mine field. Those clairvoyant have reported a higher concentration of negative entities here. (Yet, I do believe higher beings are thick here as well, just that fewer people can access them, or know how to. )Some truly disempowering religious and political propaganda exists here, “comfortably” alongside the traditional animist and shamanic traditions of the region (pre-Islam and pre-Buddhism); the seers, mediums, exorcists and shamans from of the Taoist tradition (carried down from 19th century Chinese immigration); and the more recent healers and lightworkers. I don’t know if you’ll find a more diverse range of religious or spiritual offerings anywhere on earth. We have countless temples, mosques, churches and holistic centers (registered and home-based) for this small island of around 5 million residents. Even the US-styled megachurches (and the LGBT bigotry with them) are here. The story of Sang Nila Utama, Parameswara, and Raffles, the British emissary who established Singapore a trading port, all follow the pattern of an outsider and visitor to the island seeing its potential as a power base. It was the British who started the ball rolling, turning this island into a cosmopolitan melting pot. Soon after the trading base was established, the island became home to not only the indigenous Malays, but British, Scottish, French, Armenian, Indian and Southern Chinese people who saw opportunity here. In 1942, the Japanese invaded, defeating a British army that was mainly composed of men from all over the British Empire. The island has had a lot of “invader/immigrant” energy for at least two hundred years. It’s interesting to speculate why. Sentosa (the island with the largest Merlion statue) and the islands south of Singapore were part of Lemuria. I’ve heard this from at least two different sources now. It struck me as unlikely but not impossible at first, having first read of the lost continent being in the pacific. But it’s not too far-fetched, if one looks at the map above and sees the location of Bali (the second, unmarked star) and Java. Gunung Padang, thanks to Graham Hancock’s work, is looking like it has history that predates the arrival of Hinduism to this region, being that some of the structures there truly look like terraced pyramids! Put all this together, and you have a nice puzzle of what’s been on my mind the past week about the significance of the Lion City and its location and energies. I have no answers, only questions. And I keep my mind open. Catch you after the Lion’s Gate!